The Dainese Nexus Perforated Jacket is the center of new-fashioned motorcycling gear. Modern Dainese design with sporty aggression give the Nexus leather jacket its contemporary look and and feel. Cowhide leather resists abrasion and CE rated armor at the elbows and shoulders absorb impacts. Complete the impact protection by adding optional double chest protectors and a back protector, both sold separately. S1 bielastic fabric makes sure the fit is snug while allowing freedom of movement. Items showing “3-5 Days” will ship as soon as we receive the item from the Dainese US distribution system which can range from one to four weeks. 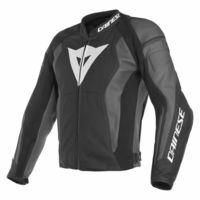 The Dainese US distributor relies on inventory in their US warehouse as well as inventory overseas. Unfortunately their system is not capable of giving us a more accurate real-time estimate . If you are concerned about the shipping time on any particular item showing “3-5 Day” availability, please reach us using the Customer Service link here on our website, otherwise, we’ll assume you are OK with the longer time frame for delivery.